1. The Entrance Depending on the venue of the wedding, there may be an opportunity to create a grand entrance. This is where your guests create their first impression. There are two types of entrances – entrances into the building, and the entrance into the hall. When it comes to the outside of the building, some areas to light would be the pathways leading up to the entrance of the building. Not only is this needed to guide the guests into the building, but this can also set the tone or theme to the reception. If you are having a winter themed reception, then you can start this by using bright blue and white wedding lights to flood light over the building façade, or use multiple up lights that shine on the building. Then there is the entrance of the building (the doorway). You can hang lights over the entrance and on the sides. As this is an outdoor area you could use real gas flame torches. An alternative would be flame lights, these are torches that have lights instead of flames, but mimic the flame effect. These can also be used inside. Once the guests are inside the building, there could be other areas where lighting plays a part. Any hallways leading to the main hall can have string lights or up lights washing the walls and floor with light, guiding you guests. The entrance to the hall can once again have up lighting – to create a dramatic effect. You can personalize this space by having wedding monogram lighting, where the bride’s and groom’s names are displayed with light. Once again you can use the light based (not gas) torches. 2. Architectural Elements Once you are inside the main space there are a number of architectural elements that can be lit to create the right ambiance. Columns: These are usually disregarded architectural elements, but they can be lit up to create a grand ambiance. Up lights placed at the base, can shine light up the columns. Or you can wrap string lights around them – maybe even wrap fabric over the lights, to diffuse them – creating a fairytale like effect. Walls: Depending on the layout and space of your venue, you might want to add lighting to bare and dull walls. 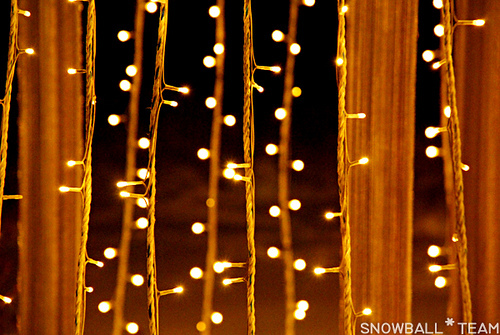 Some light ideas for walls include: the fairy light curtain – this is when you take a number of string lights and hang them side by side on a wall, on a white fabric or black fabric (used to create a starry night effect). As always up lights are also an option here. There is always gobo lighting – instead of using the bride and grooms names, the stencils can be of stars, hearts or abstract designs, that can be projected with light onto the walls. Ceiling: The ceiling can be used to really create a spectacular and dreamy setting. Lighting the ceiling will make a space feel grand and spacious. If you want to create a more intimate, cozy feeling will want to have the wedding reception lights closer to the ground, with little ceiling lighting. For lighting the ceiling, there are chandeliers (standard size or mini) that can be rented, up lighting, or gobo (stencil) lighting. You can create a marquee/tent like effect in a hall by using string lights. Hang them from the walls, going inwards and upwards to a point up onto the ceiling, like a tent (this center point will become a focal point.) You can hang drapes along with the lights. The head table can be made to stand out amongst the rest with a few wedding lighting ideas. 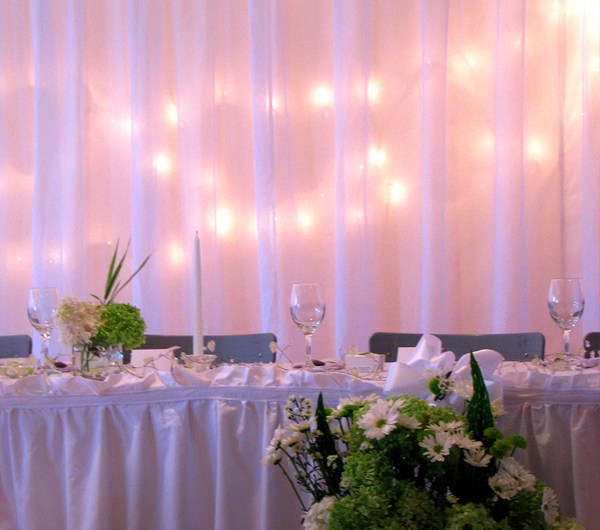 Depending on your table arrangement you can use under table lighting, or hang string lights with additional drapery around and on the table. Larger centerpieces with pin lighting will also work, as well as hanging a mini chandelier above the table. If you plan on having a stage for a band, this will require some stage lighting. 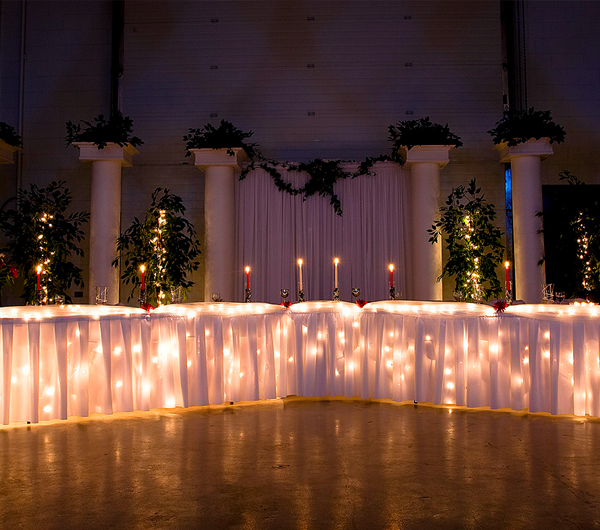 Most wedding venues will have the standard stage lights. A controlled spot light would be ideal to highlight people who are giving speeches, on a stage or on the venue floor. Then there is the dance floor. Dance floor lighting is generally provided at venues, or can be easily hired. Some dance floor lighting ideas include: music synced colored lights and a disco ball. 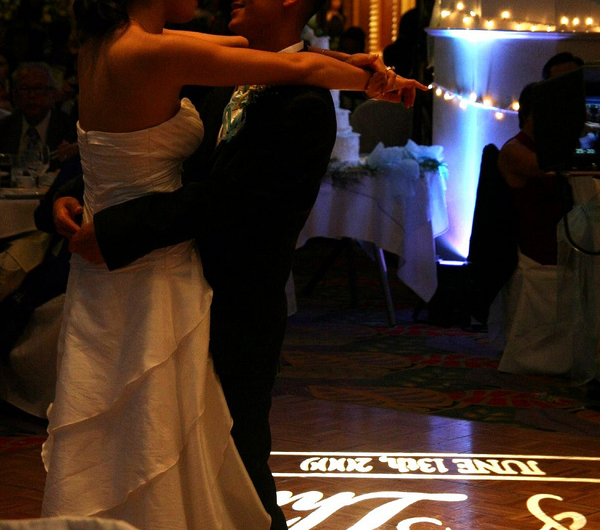 You can also use monogram lighting to have the names projected onto the dance floor. This, along with a spotlight, will be great for the first dance. Be careful not to have too many lights, as it can get hot. 7. Display Lighting If you have any floral arrangements or would like to highlight a multiple tiered cake, then display lighting will be needed. These are small, focused lights – like you see in a jewelry store. LED wedding lights would be recommended as they produce less heat – as you will want to be careful with the amount of heat and the closeness of the lights, with delicate items such as a cake and flowers. Extra: Outdoor Wedding Lights. If you are planning on an outdoor wedding, there are a number of other areas that can be lit up to create the ideal setting. For example, washing any water feature such as a pond or a pool with light will create elegance in the outdoor space. 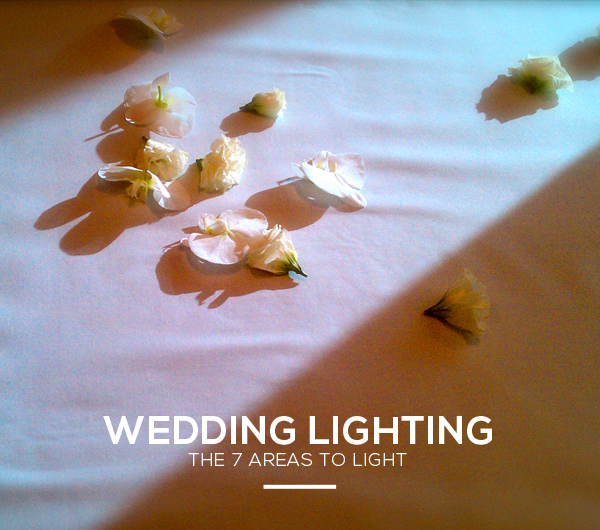 See here for our guide on outdoor wedding lighting or the guide on wedding tent lighting. Wedding monogram lighting is when you have, traditionally, the name of the bride and groom projected onto a surface with light. It is a very cost effective way of creating a unique and personalized wedding venue. They are used to create inviting entrances, focal points within a room or an enchanting backdrop for a wedding. How it works: to create monogram lighting for weddings you first need to make a stencil of a design. The stencil is used to create a cutout – a “gobo”, which then goes in front of a light fixture. The light only shines through the open areas of the stencil creating monogram lighting. The traditional way is to have these stencils cut out of a metal material, but there are now glass options – or even projectors can be used (which have their pros and cons). The first thing to do is to get a design. The design can be of anything. If you only want to do one monogram, then get the names done of the bride and groom in a poetic, cursive font. You can use the graphics or font from the invites, your wedding logo, cake design, or décor. This makes the graphic design elements of the wedding ever more important and valuable, as they can have a wide range of uses. A graphic designer or monogram cutters will have a range of elegant fonts to choose from to create your design. Don’t forget you can also get abstract designs made i.e. 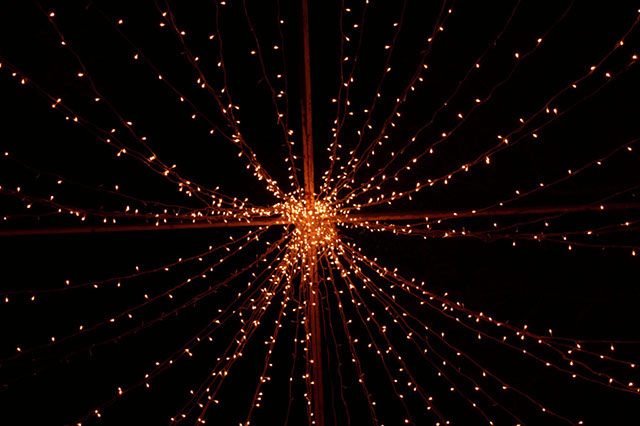 stars, heart, or floral lights, which will create patterns and act as simple wedding lighting decorations. These are ideal for dance floors, wedding tent lighting, etc. Ready made wedding gobos like these can be bought online. Once you have your design, you will need to create a stencil. How you create the stencil will be based on how you plan on making your gobo. The gobo is the end product – which is fitted over a spot light or a can light that are common lighting fixtures at weddings. The gobo has holes in it, based on your stencil design, and through these holes is where the light shines though. There are two options in making gobos: you can cut your stencil into metal or high temperature glass. 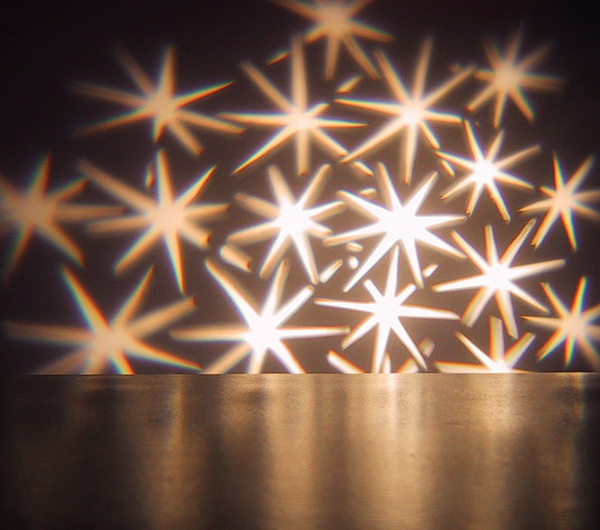 Made From Metal: The cheapest and fastest way to make a gobo is from metal. A metal gobo can be done by hand DIY, or faster and more accurately by a professional laser cutter (for this you will need to have a digital stencil made). For a DIY wedding lighting gobo project (theater students do this for school projects), create a paper stencil of your design, then with a sharp scalpel make a cut out of the stencil design onto a sheet of tin or other relatively thin metal. It is not possible to cut out a circle with a centerpiece as it will just fall through. This why bridges are needed. Limitation:One thing to remember in designing stencils for metal gobos, is that you can’t have metal within holes. You will need to have a stencil that has “bridges”. 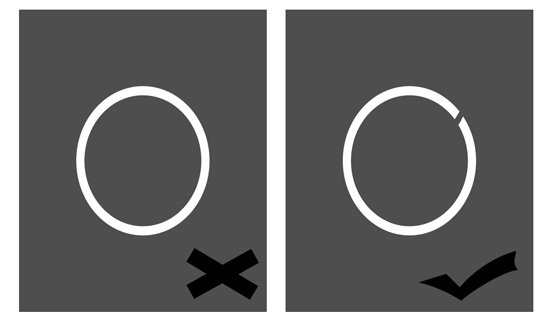 For example if you cut out a “O”, it will be a gaping hole – you can’t have a metal centerpiece as it just falls through. A bridge connects the small metal centerpiece to the outer metal. This is not a limitation with a glass gobo or projections. A Gobo Made From Glass: A glass gobo will create crisper monogram lighting. There are also fewer restrictions as you can have more detailed graphics made with glass (no bridges necessary). A glass made gobo is slightly more expensive – but not by much. Custom gobo lighting made with laser cut metal can cost up to $100 – $200, while a glass wedding gobo can cost around $150 – $300. This small investment for these stylized wedding lights will form a grand décor piece, one that can tie together a wedding. Using Projectors: The upside in using a projector, instead of going through the process of creating gobos for monogram lighting, is that they are flexible, cheaper and faster to create. A projector can have moving images, while gobo lighting will be static. All you need to do is upload graphics and images onto a computer that is connected to the projector. These projectors usually come with the wedding hall, or are easy and inexpensive to rent for the day. The downside though is that a projector does not create elegant monogram lighting. This is because projectors display a whole rectangular area – you can’t cut off the light surrounding the monogram. The room needs to be quite dark for the projection to be seen, while a gobo in a spotlight can work in more brightly lit conditions. 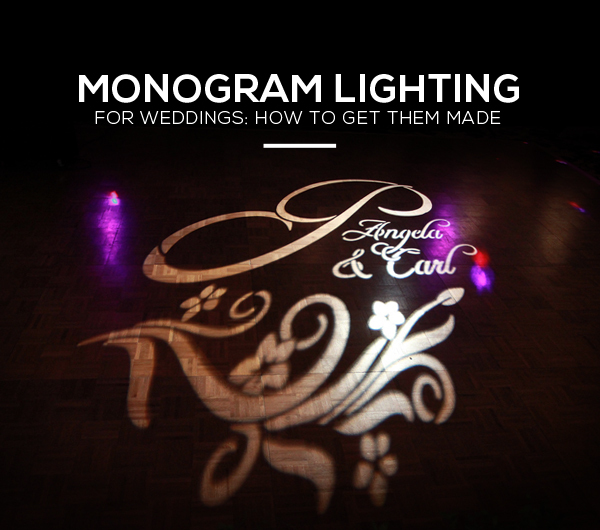 Projections are a faster and easier way of creating monogram lighting. They can also be used for decoration lighting, such as on the dance floor or on walls to project photos, and videos. Want to go a step further? How about 3D projections. Monogram lighting is ideal for a number of areas within a wedding space. They work well for entrances and on walls. Dance floor monogram lighting is a great idea for a couple’s first dance. Graphic designs such as flowers or stars work well as wedding lighting ideas for ceilings, walls and also on the dance floor. Gobo lighting for weddings adds a luxurious touch. They help personalize a space. The steps it takes to create and the amount of monogram lighting equipment needed is minimal. So when it comes to planning the wedding decorations or lighting, monograms should be top of the list.